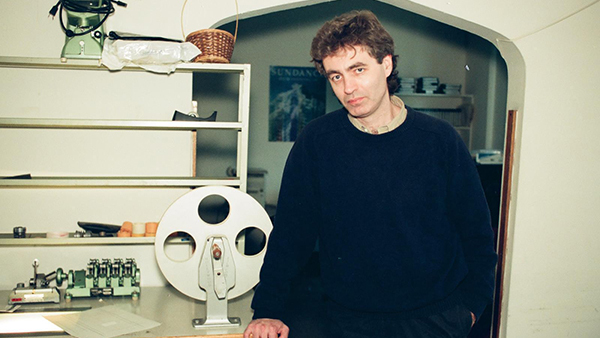 A mid-1990s photo of documentary filmmaker Steve James. Courtesy Kartemquin Films. Since its founding a half century ago, the name Kartemquin Films has become synonymous with the best in documentary filmmaking. Based in Chicago, this pioneering nonprofit production company was founded in 1966 by filmmaker Gordon Quinn, along with collaborators Jerry Temaner and Stan Karter (founding partner Jerry Blumenthal joined the company in 1967), who wanted to create a home for socially relevant cinema explorations. This Friday, for the occasion of its fiftieth anniversary, Kartemquin is celebrating with a monumental gala event that will bring together generations of the company’s filmmakers and their subjects, along with many more who have supported (and continue to support) its steadfast mission. 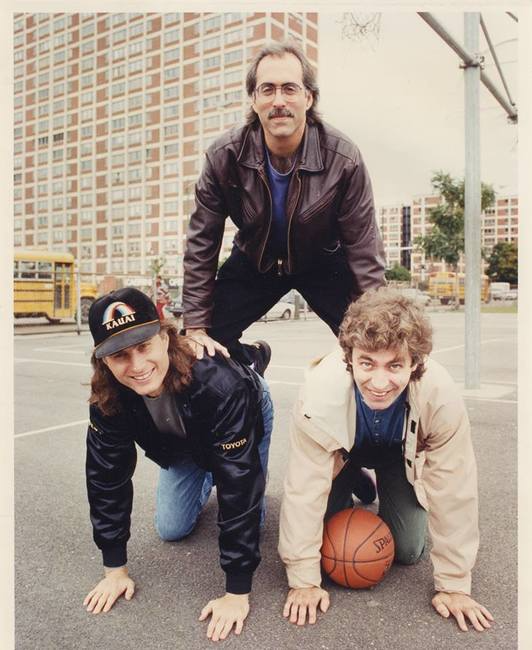 In honor of Kartemquin’s semicentennial anniversary, I recently had a conversation with filmmaker Steve James about the company. 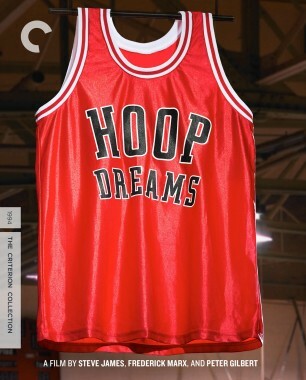 James’s groundbreaking 1994 documentary Hoop Dreams—which follows two inner-city Chicago high school students over the course of five years, as they attempt to become professional basketball players—was produced through Kartemquin, and James has been one of the company’s associates for three decades. We chatted about how Kartemquin has grown over the past fifty years, what his work with the company has meant for him, and what motivates him as a documentarian. When did you first fall in love with documentary filmmaking? I first fell in love with narrative films—that was initially what happened, and I had more aspirations in that direction—but when I ended up at Southern Illinois University in Carbondale in a master’s film program, that’s where the interest in documentary took root. I think it was partly due to a professor there that was good with documentary and shared that passion. Also, before I decided I wanted to make films, I had an interest in radio journalism and thought maybe that might be a career path, so I think what happened with documentary is that it combined those twin interests—the newfound love of movies with my older journalistic leanings. At which point did you first hear about Kartemquin? When I was at Southern. A group of students started up a student-run film festival down there—still going strong—called Big Muddy Film Festival. The very first year of the festival, they had Jerry Blumenthal come down as a judge and to present some of Kartemquin’s work. I went to the presentation and thought, Wow, what a great company and a cool mission they have. So, when I moved to Chicago to start my own career in film and had this idea that became Hoop Dreams, I thought maybe they would be interested in taking us under their wing with this project that we had no money for and was to be my first non-student film. I went to them and met Jerry, but I ended up having a real meeting with Gordon, and he liked the idea of what we wanted to do, which was not nearly as ambitious as what it became. He liked the idea of it, and the company did take us under their wing and helped sustain ourselves during the film, and that was the beginning of my relationship with Kartemquin. 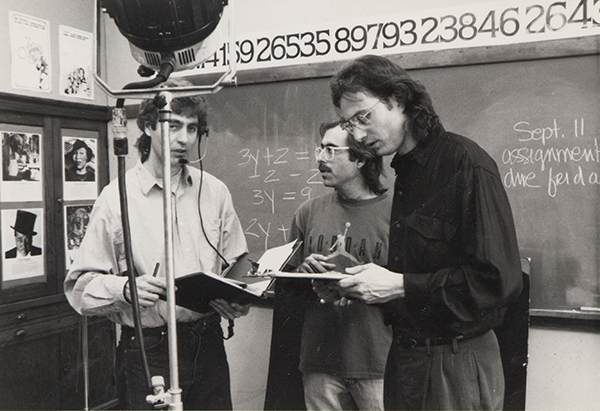 James on set with fellow filmmakers Peter Gilbert and Frederick Marx. Courtesy Kartemquin Films. Was there a particular reason you chose to make movies in Chicago, rather than New York or Los Angeles? When I was going to leave grad school, I was married—still am—and I floated the idea of maybe going to New York, and my wife just did not like that idea; it seemed too intimidating to go there. Los Angeles was a possibility, but I wasn’t particularly interested in L.A. I knew I wanted to do this Hoop Dreams idea, and I knew New York would be a good place, but I knew Chicago would also be a good place to do this story because of the tradition of basketball in this city. I liked the idea of coming to Chicago; I didn’t know much about Chicago, but a big part of my motivation for coming there was I needed to go some place where there was an industry and a way to make films. Kartemquin has been a mainstay in Chicago for half a century now. In your time there, what have you seen change and adapt about the company—and what has remained constant? I’ve been associated with Kartemquin for a long time now, it’s been about thirty years, which is kind of astounding to think about. When I first got here, it was still in the same place, although they had only had one floor. They owned the building, but they were renting out the first floor to a union for a plant that was down the street. So it was a more modest enterprise. They really only had about two people that were literally on staff. Gordon and Jerry didn’t pay themselves as staff—they paid themselves from doing the work. So they had their passion projects, their documentaries that they would raise money from foundations and such to do, but they also had this other arm, that was more of a for-profit arm, that basically did a lot of sponsored work. They did union work and they tended to do projects that were socially relevant, but they were like commissioned work and they weren’t real documentaries in that sense. That was kind of the way in which they sustained themselves and sustained the company, which was really quite small. So, when I became affiliated with them, I got this opportunity to have them help shepherd and mentor the making of Hoop Dreams, and I eventually got the opportunity to do some of this more sponsored work that helped pay my bills, because Hoop Dreams was not a very well-funded project. So it ended up being a kind of ideal place for someone like me to have a sustainable career while I pursued my own work, and in that way it very much mirrored what the company as a whole is doing and has been doing for a number of years. What changed—and Hoop Dreams contributed to this, I think—was that the company became more successful in putting out and getting funding and audiences for their documentaries. They were able to do far less of that sponsored work and devote more time and energy to the films they wanted to make. And then there were more people like me who were what we call “Kartemquin associates”—not on staff, but affiliated to come in and do films through Kartemquin. And that’s what Kartemquin has evolved to. But they’ve changed so much over the years. I’ve seen them in lean times where there wasn’t a whole lot going on, all the way up to today, where they have both floors and at any one time four, five, six films in production and postproduction. They have a legitimate board and fundraisers now, where board members allow us to have a party at their swanky downtown high-rise condos. Kartemquin is still Kartemquin in that the company mission hasn’t changed, but creatively it’s broadened. The kinds of films that get made there are more varied than they were back in the old days, but there’s still this commitment to doing films that matter, that tackle relevant issues and do it in a complex and thoughtful way. The place itself, it’s upgraded a little bit but it’s still got that grad school vibe, which I think is one of the more appealing things about it. It’s become a true cultural institution in Chicago—anybody in the arts knows about it, and even beyond the arts they know what Kartemquin is and what it’s about, and I think there’s a lot of pride in the city. Even beyond Chicago, when you go to film festivals, people know the Kartemquin catalog in a sense. There are a lot of filmmakers now who aren’t even living here, who will bring projects to Kartemquin, because they want Kartemquin to be involved and help them and bring what Kartemquin brings to so many projects. So it’s been an enormous change—the core values haven’t changed but the institution has. What have you learned from working with Gordon Quinn and the other people at Kartemquin? Well, Gordon had a very profound impact on me, and continues to have one, but especially in the earlier years. Hoop Dreams took seven, eight years to make, and he had a big impact on that film, in terms of mentoring me and the other key people. He put in an enormous amount of time once we got into the edit room, and he worked very closely with me on my second documentary, Stevie. He was not just an executive producer, he was also a producer and one of the camera people, so he was very intimately involved in that film. Over the years, he’s worked less with me—he still comes into the edit room, which is wonderful, but he works less with me now, because he’s got other filmmakers that he’s doing what he did for me for. 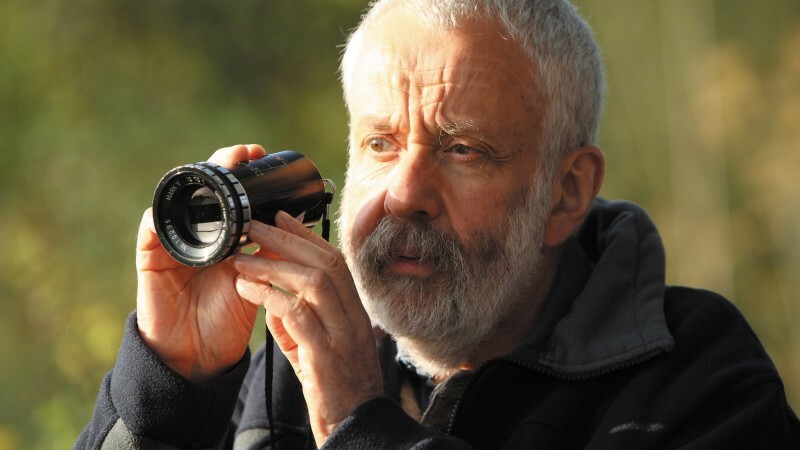 He’s involved in so many films in Kartemquin where he plays that role, so there are all these filmmakers getting this kind of benefit now that I got. There’s a young filmmaker named Bing Liu who’s got a really great film there—Bing’s been working with me on this high school doc miniseries, but he’s finishing up his first film, called Minding the Gap. A few weeks ago he told me he had this really great long day, where he just went through his film with Gordon, and I was like, I remember, I remember that. I remember what it was like to be a younger filmmaker and have that experience and what you learn from that. I feel very lucky; it’s a community of filmmakers, and it goes beyond Gordon, of course. 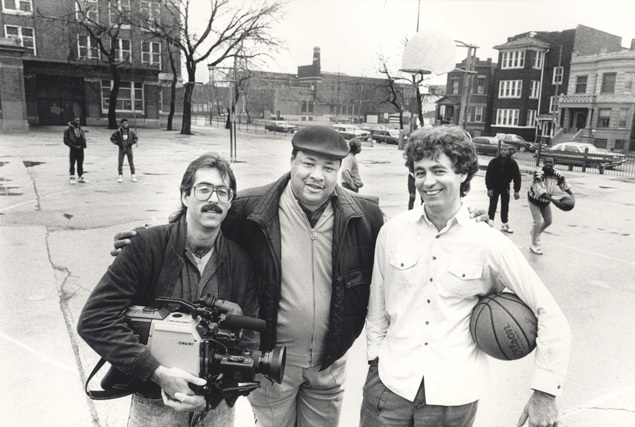 When I started with Hoop Dreams, if you didn’t have money, you had to find someone who had a great camera and hopefully was good with it to commit to your project without compensation, or much compensation, and you had to find a place like Kartemquin that would allow you to come in and edit and take you under their wing. You had to find ways to get around not having money to make your film, and that’s changed. You can have a pretty inexpensive camera that shoots pretty great images now, and you can edit on your laptop—so there’s a lot of young filmmakers who are craving a filmmaking community, because they may be out there just doing it kind of on their own. And I think one of the great things that Kartemquin has to offer to filmmakers these days, which won’t go away because of technological changes, is that sense of a community of filmmakers who will both help you make your film but also can look at what you’re doing and give you honest and constructive feedback and help you become a better filmmaker. That’s something that I feel really lucky to have had all these years. I meet filmmakers from New York, San Francisco, or L.A., and there are no Kartemquins out there, and I keep wondering why not: I guess it’s a lot harder to pull off! When you’re starting out making a new film, what draws you to a subject? It is serendipitous in a lot of ways; ideas come from different places. Often it’s my own idea, but sometimes it’s not. The film I did on Roger Ebert that came out a few years ago [Life Itself] was suggested to me by producer Garret Basch. The Interrupters came out of an article written by a good friend of mine, Alex Kotlowitz, in the New York Times Magazine. He lives like four blocks from me and I knew he wanted to do something, so I called him up and said, “I love this article, and I think it would make a great basis for a documentary,” and we just went out and did it. 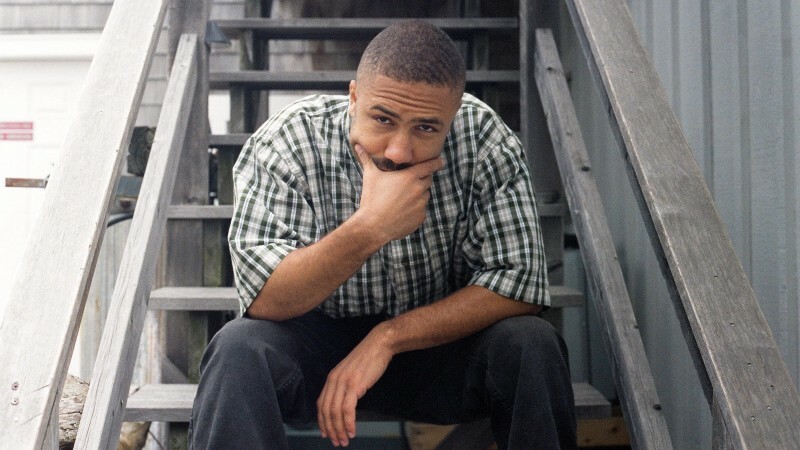 But, you know, there are certain themes that run through a lot of the work that I’ve done: I’m very interested in people who are typically seen as being on the margins of society, either racially or economically or both. I’m interested in race and class issues, and the way in which they play out in people’s lives. A lot of my films have dealt with race in some fashion. I’m very interested in family, and a lot of the films have delved into family in some way. So, you know, I don’t generally start with, oh, there’s some theme I want to explore—it’s usually something that triggers or hits me that I find really fascinating or interesting. I find myself fascinated, and that leads me to want to do something on it. Sometimes I don’t fully figure out what the fascination is until I’m really deeply into it; I just know that I’m really interested in it. I liked what you said before about finding a community, because having those people to foster and support you and share ideas is really essential. Do you have any other advice for aspiring documentary filmmakers? I do think finding collaborators is important, people who will not just help you but push you, challenge you to be better, to make it better, and to not settle. I also think that to make it, you have to be resilient enough to overcome rejection, because there’s a lot of rejection. You may have an idea for something, and people may not get it for a while—they may never get it. But you have to stay the course sometimes even despite rejection, and sometimes it’s just simply that you can’t articulate it in a way that they get it, or you haven’t quite found what it is about it that will make it resonate for people. You feel it, but you haven’t found a way to express it, and that’s kind of what the filmmaking process is about, it’s about that journey that you go on. I guess the other bit of advice is that when you get an idea—and you feel like, wow, this is a great idea, I’m going to go do this—don’t become so enamored of the idea that that you don’t keep your eyes open for where the story and the idea or action might lead you. I see films sometimes where I feel like the filmmaker went into it with an idea of what they wanted to tell and what they wanted to say, and by God, that’s what they did, even though sometimes I see evidence in the film they made of a film that would have been more interesting and more complex and more honest, had they allowed themselves to go there. I think young filmmakers sometimes learn this the hard way, but no matter how great your idea is, the reality is probably going to be far more interesting. 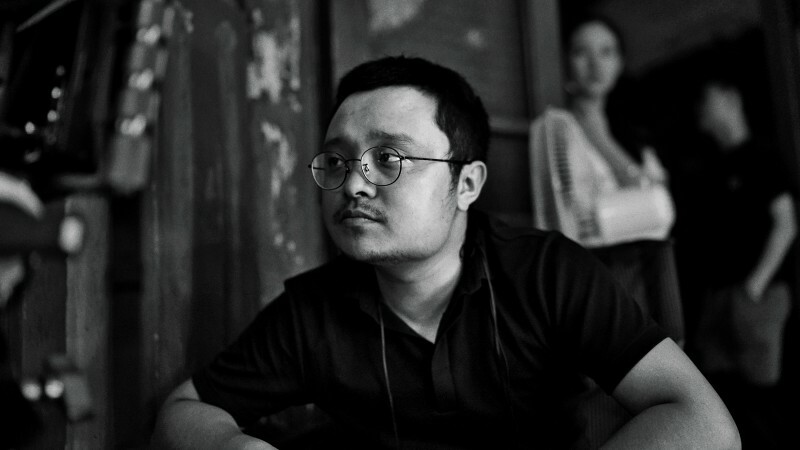 And I pray for that as a filmmaker: if I just went out and got what I had in mind, then God, why did I even bother?